A new species of Masenia Chatterji, 1933 is described based on material from the intestine of Clarias gariepinus (Burchell) in the Incomati River, Mozambique. The combination of morphological characteristics and analysis of 18S and 28S rDNA sequences delineated the specimens found in the present study as a distinct species. The new form is distinguished from other Masenia spp. in having a large reniform seminal receptacle, a cirrus-sac ending anterior to the ventral sucker, intestinal caeca extending into the hindbody to the level of the posterior testis, and the vitelline fields extending anteriorly to the ventral sucker and posteriorly to the middle of the ovary. Notably, the new form is the only record of African species having a sac-shaped excretory vesicle. Analysis of 28S rDNA sequence data supported its placement in the Cephalogonimidae Looss, 1899. 18S analyses also supported its placement in this family but showed it was not closely related to Masenia bangweulensis (Beverley-Burton, 1962), the sole other African species for which genetic data is currently accessible. The total pairwise differences for 18S and 28S sequences showed the new form differing from other cephalogonimids. Thus, both morphological and genetic characteristics indicate that the present form represents a distinct species, here described as Masenia nkomatiensis n. sp. An updated key to African Masenia spp., now five, is provided. This article was registered in the Official Register of Zoological Nomenclature (ZooBank) as CD42E301-768B-498B-8B67-80FDA85BB40A. This article was published as an Online First article on the online publication date shown on this page. The article should be cited by using the doi number. This is the Version of Record. Cephalogonimidae Looss, 1899 is a small family containing small, spinose digeneans parasitic in the gastro-intestinal tract of fishes, amphibians and reptiles (Jones & Bray, 2008). Adult cephalogonimids have a genital pore at or near the anterior extremity and a long cirrus-sac terminating at different levels in the forebody (Jones & Bray, 2008). It comprises five genera: Cephalogonimus Poirier, 1886; Paracephalogonimus Skrjabin, 1950; Cephalogonimoides Brooks & Buckner, 1976; Emoleptalea Looss, 1900; and Masenia Chatterji, 1933. Species of Masenia (syns Eumasenia Srivastava, 1951 and Pseudomasenia Pan, 1984) inhabit the intestine of marine and freshwater fishes of the class Actinopterygii throughout Africa and Asia (Jones & Bray, 2008; Madhavi, 2011). Adults of species of Masenia can be distinguished from the other cephalogonimids by the possession of two rows of enlarged circumoral spines and vitelline follicles located mainly in the hindbody (Beverley-Burton, 1962; Jones & Bray, 2008). Species delineation within the genus is based on the body shape and size, arrangement of the internal organs, number of the circumoral spines, the shape of the excretory vesicle, the size of the eggs and the extension of vitelline follicles, the caeca and the cirrus-sac (Khalil & Thurston, 1973). Currently, 22 Masenia spp. are considered valid with a remarkable breadth of fish families infected. They are clustered into two groups, those described from Africa and those from Asia (Table 1). The Asian group includes 18 species; of these 14 were described from freshwater hosts in the Channidae Fowler, Bagridae Bleeker and Heteropneustidae Hora, and four species were described from marine hosts in the Engraulidae Gill, Carangidae Rafinesque, Sciaenidae Cuvier and Mullidae Rafinesque (see Madhavi, 2011). The African group contains four species described from fishes of the freshwater families Mochokidae Regan and Clariidae Bonaparte (see Khalil & Thurston, 1973; Khalil & Polling, 1997). In Africa, few recent contributions on the biology and taxonomy of Masenia are available and all descriptions and reports on Masenia spp. were based on morphological data; only one DNA sequence is currently available for M. bangweulensis (Beverley-Burton, 1962) from Tanzania (Mwita & Nkwengulila, 2010). An unidentified species of Masenia was collected from C. gariepinus in Mozambique; it is here described as a new species. As no Masenia spp. has been subject to electron microscopical examination, scanning electron microscopy (SEM) and histology were performed together with morphometric analysis of the internal morphology of the new species. This study increases the knowledge of African Masenia species diversity by describing a new species based on a combination of morphological and molecular characters of adult specimens collected in a freshwater system in Mozambique. The Incomati River is one of the major trans-national basins and traverses three countries, i.e. Republic of South Africa, Kingdom of eSwatini (previously Swaziland), and Republic of Mozambique; in the latter country it plays a major role in shaping the natural habitat (Vaz & Pereira, 2000; Da Silva & Rafael, 2014). For the present study, five collections were performed at two sites on the Incomati River: three collections at site 1 (Manhica, 25°44′16.6″S, 32°36′8.4″E); two collections at site 2 (Calanga, 25°25′44.04″S, 32°48′44.7″E). Sharptooth catfish, C. gariepinus [n = 154, standard length 19–64 (37 ± 9) cm] were collected using gill nets of 2 mm and 4 mm mesh size. Fish were euthanised by severing the spinal cord with a single cut posterior to the skull, dissected and the intestine examined for digenean trematodes. 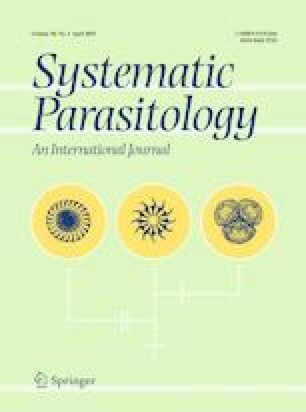 Freshly recovered parasites were washed in saline solution and preserved either with 70% ethanol for light and scanning electron microscopy (SEM) study (Dos Santos et al., 2015; Jyrwa et al., 2016), 10% neutral buffered formalin for histological study, or 96% ethanol for genetic analyses (Blasco-Costa et al., 2016). Additionally, some of the parasites were slightly flattened in a drop of alcohol-formalin-acetic acid (AFA) between a glass slide and coverslip, and subsequently transferred to 70% ethanol (Jyrwa et al., 2016). For light microscopy (LM), whole ovigerous adult specimens (n = 25) were stained with acetocarmine, differentiated in acid alcohol, dehydrated in a graded ethanol series, cleared in beechwood creosote and mounted in Canada balsam under a coverslip on a glass slide (Bakke, 1986; Thatcher, 2006). Specimens for histology were washed overnight in running water, dehydrated in ethanol and embedded in TAAB Transmit LM Resin Kit (TAAB, UK) following the standard protocol suggested by the manufacturer. Sections 5 µm thick were cut, stained with hematoxylin-eosin and examined by LM for digestive and excretory systems’ termination and the structure of the cirrus-sac. Drawings were made from whole mounts using a drawing tube attachment and terminologies are in accordance to Manter (1970). Measurements and photomicrographs were obtained with a Zeiss Axioplan 2 imaging LM and AxioVision software Release 4.7.2 (Carl Zeiss, Jena, Switzerland). Measurements are given in micrometres unless otherwise stated and are shown as the range, followed by the mean in parentheses. Adult flukes (n = 60) fixed for SEM were dehydrated through an ascending series of ethanol to absolute ethanol and transferred to increased concentrations of hexamethyldisilazane (HMDS): absolute ethanol (Merck, Germany) for 15 min each (Dos Santos et al., 2015). Specimens were mounted on a strip of carbon conductive tape fixed to a microscope slide and then dried in a Sanpla dry keeper desiccator cabinet (Sanplatec Corporation, Japan) for at least 48 h, coated with gold in an Emscope SC500 sputter coater (Quorum Technologies, Newhaven, UK) and viewed with a VEGA 3LMH scanning electron microscope (Tescan, Brno, Czech Republic) at an acceleration voltage of 5 kV. In the present study, due to the geographical region in which the specimens were collected, the key for African maseniids was used. For the amended key of Khalil & Thurston (1973) for Masenia from African fishes, characteristics such as the number of circumoral spines, the extension of intestinal caeca, and the shape of the body, oral sucker and excretory vesicle were considered. Genomic DNA was extracted from seven ethanol-fixed specimens from different fish. Before extraction, each specimen was rehydrated through a descending ethanol series and washed in water overnight. DNA was extracted using the DNeasy® Blood and Tissue kit (Qiagen, Manchester, UK) following the standard protocol suggested by the manufacturer. Polymerase chain reaction (PCR) for the 18S rRNA gene (spanning the V4-V5 variable regions) was performed using the forward primer JLR24 (5′-CGG AAT TCG CTA GAG GTG AAA TTC TTG G-3′) and the reverse primer JLR25 (5′-CCG AAT TCC GCA GGT TCA CCT ACG G-3′) according to Campos et al. (1998). The 28S rRNA gene (D1-D3 variable regions) was amplified using the forward primer dig12 (5′-AAG CAT ATC ACT AAG CGG-3′) and the reverse primer 1500 (5′-GCT ATC CTG AGG GAA ACT TCG-3′) according to Tkach et al. (2003), using a MultiGeneTM OptiMax Thermal Cycler (Labnet International Inc, North America). For each marker, the total volume for the PCR reaction was 30 μl, including 1U Taq polymerase, 1 μl of 100 μM dNTP, 3μl of 2.5 mM of MgCl2, 3 μl 1× reaction buffer, 2 μl of each primer (10 μM) and 10 μl of DNA template. PCR conditions were: initial denaturation for 15 min at 95 °C, 40 cycles of denaturation for 30 s at 93 °C, annealing for 90 s at 52 °C, and an extension for 2 min at 72 °C, followed by a final extension step for 5 min at 72 °C. Successful amplification was confirmed using 1% agarose gel (1g of agarose in 100 ml TBE buffer), impregnated with GelRed® (Biotuim), in an ENDUROTM Electrophoresis Systems (Labnet International Inc, North America). Amplicons were sequenced following Avenant-Oldewage et al. (2014) in both directions. Electropherograms were inspected and edited manually (if required) using MEGA v6.06 (Tamura et al., 2013) and then combined in the BioEdit sequence alignment editor (Hall, 1999). A hundred similar sequences obtained through BLAST were aligned to the obtained sequences using MUSCLE algorithm (Edgar, 2004) as implemented in MEGA v6.06. Eighteen 18S rDNA sequences and 15 28S rDNA sequences were included in the final analysis. Pairwise differences were estimated for each dataset using the following conditions according to Bray et al. (2018): “variance estimation method = none”, “model/method = No. of differences” and “Substitutions to include = d: Transitions + Transversions” and “Gaps/Missing Data Treatment = complete deletion” in MEGA. Phylogenetic analysis through maximum likelihood (ML) method based on Tamura-Nei model (Tamura & Nei, 1993) and parsimony (MP) method using subtree-pruning-regrafting (SRP) algorithm (Nei & Kumar, 2000) were conducted to explore relationships among taxa with MEGA v6.06 (default settings). Nodal supports for produced topologies (rooted) were calculated using 1,000 bootstrap replicates (Felsenstein, 1985). Given the position of members of the family Haematoloechidae [Skrjabinoeces similis (Looss, 1899) (GenBank: AJ287575) and Haematoloechus longiplexus (Stafford, 1990) (GenBank: AJ287520)] in Olson et al. (2003), they were designated as functional outgroup taxa. Representative sequences for both 18S and 28S rDNA generated in this study were submitted to the GenBank database. Type-host: Clarias gariepinus (Burchell) (Siluriformes: Clariidae). Type-locality: Incomati River (25°44′16.6″S, 32°36′8.4″E), Manhiça District, Mozambique (coll. March 2017). Other locality: Calanga (25°25′44.04″S, 32°48′44.7″E), Manhiça District, Mozambique. Type-material: Holotype: ovigerous adult specimen was deposited in the Iziko South African Museum, Cape Town, South Africa (accession no. SAMC-A091284). Paratypes: 8 specimens were deposited in the Iziko South African Museum, Cape Town, South Africa (accession nos SAMC-A091285-A091292); 8 specimens were deposited in collection of the Natural History Museum, London, UK (accession nos NHMUK 2019.1.17.1-8); and 8 specimens were deposited in the Royal Museum for Central Africa in Tervuren, Belgium (accession nos RMCA_VERMES_38600 -RMCA_VERMES_38607). Site in host: Intestine (anterior section). Prevalence and mean intensity: 18.83% and 26.11 worms per infected fish. Representative DNA sequences: Gen Bank: MH142267 (18S rRNA gene); MH142268 (28S rRNA gene). Etymology: The name of the species refers to the Nkomati River in which the host was collected. [Based on 25 specimens; metrical data in Table 2]. Body ellipsoidal, 645–1,533 (1124) long, 276–549 (447) wide at level of ovary. Tegument spinous; spines dense on anterior, middle, 4 long; scattered in posterior region, 3 long. Forebody 222–492 (332) long, hindbody 430–982 (676) long. Oral sucker funnel-shaped, terminal, 103–171 × 94–198 (137 × 125) (Fig. 1A); 2 rows of alternating spines interrupted mid-dorsally at level of genital pore present (Fig. 2B); oral and aboral spines conical, acuminate, directed posteriorly; oral spines 8–16 (13) long, aboral spines 7–10 (9) long (Fig. 2B, C). Anterior region, of opening of oral sucker with 22 ciliate papillae with symmetrical distribution pattern, mostly aggregated on mid-dorsal interruption; single papillae present between circumoral spines (Fig. 2C, D). Ventral sucker spherical, 112–165 × 106–171 (140 × 137), with 2 rows of small tegumental papillae on outer lip and nine larger papillae on inner lip (Fig. 2E). Oral to ventral sucker length ratio 1:0.67–1.26 (1:0.99); width ratio 1:0.68–1.34 (1:0.93). Prepharynx 0–22 (4) long, not visible in some specimens. 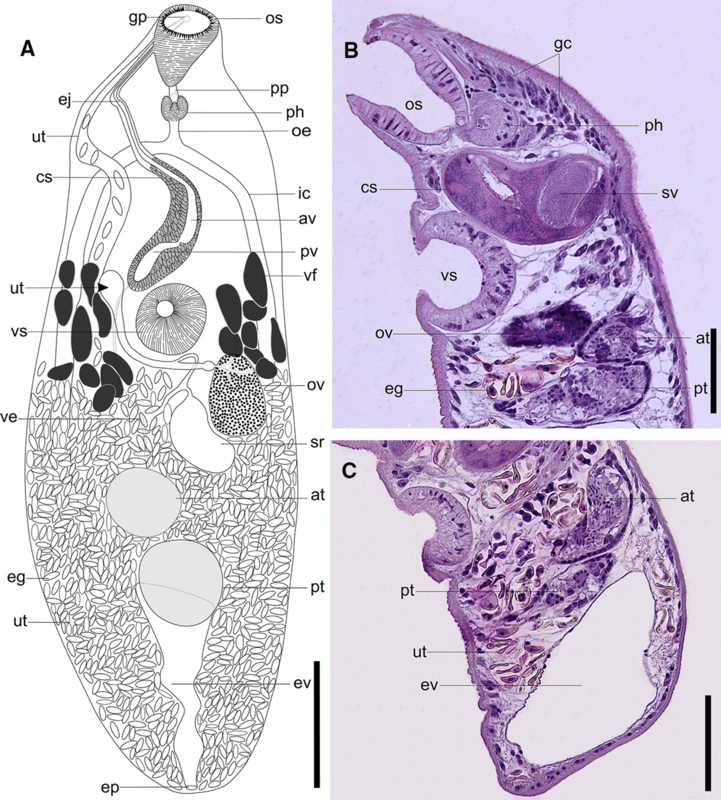 Pharynx four-lobed anteriorly, 33–57 × 33–64 (43 × 51) (Fig. 1A). Oesophagus 0–30 (7) long. Intestinal bifurcation in forebody. Caeca extend into hindbody to level of posterior testis. Testes 2, smooth, oblique, post-equatorial, oval in dorso-ventral view; anterior testis dextral, 66–163 × 89–175 (111 × 128), connected to seminal vesicle through vas efferens; posterior testis 68–177 × 104–208 (114 × 143), vas efferens not observed (Fig. 1A); post-testicular distance 191–560 (353). Cirrus-sac 399–762 × 51–114 (587 × 75), contains bipartite seminal vesicle (Fig. 1A), both portions long and slender, anterior portion 68–123 (94) long, posterior portion 73–134 (100) long. Prostatic cells, without diverticulum, surround seminal vesicle. Pars prostatica spherical, thin-walled by vesicular cells without nuclei. Ejaculatory duct opens into genital atrium. Genital atrium circular, large, dorsal to oral sucker. Genital pore in anterior region, dorsa-medial, at level of oral sucker (Fig. 2D). Gland cells in antero-dorsal region of body (Fig. 1B). Ovary smooth, equatorial, 69–167 × 78–154 (121 × 114). Seminal receptacle reniform, saccular, near posterior margin of ovary (Fig. 1A), 100–171 × 61–91 (112 × 73). Laurer’s canal and Mehlisʼ gland not observed. Vitelline follicles in lateral fields from anterior margin of ventral sucker to middle of ovary, intra- and extracaecal, not confluent, 234–518 (341) from anterior extremity (Fig. 1A); follicles aciniform, 16–24 in number, 41–78 × 31–43 (58 × 37). Uterus extensively looped in hindbody, extending extracaecally; uterus ascends dextrally to genital atrium. Eggs elliptical, operculate, 20–26 × 10–16 (23 × 12). Excretory pore ventrally subterminal (Fig. 2F). Excretory vesicle irregularly sac-shaped (Fig. 1A, C). Body ellipsoidal, excretory vesicle sac-shaped ……… M. nkomatiensis n. sp. For this study we generated 18S and 28S sequences of ribosomal DNA for seven specimens, producing a single haplotype for each marker. The 18S sequence for M. nkomatiensis n. sp. was 940 bp long and the 28S sequence was 1,293 bp long. Only one species of Masenia has been sequenced previously, M. bangweulensis (GenBank: DQ813461), and only 18S sequence is available for it. Sequences from GenBank included in the analysis are closely related taxa to M. nkomatiensis n. sp. in the superfamily Plagiorchioidea (Tables 3, 4). The interspecific pairwise differences between M. nkomatiensis with related 18S rDNA sequences ranged from 9–29 bp (Table 5). Intraspecific variability was only assessed for Choanocotyle hobbsi Platt & Tkach, 2003, but none could be detected. Interestingly, there is a variability between the Choanocotyle sp. sequences included. The nodal support of the phylogenetic topology (Fig. 3A) were generally low, but Cephalogonimus retusus Walton, 1938 formed a clade with M. nkomatiensis n. sp. [72% ML and 70% MP support; lowest total pairwise differences (9 bp)] despite of considerable morphological differences. Interestingly, the new species and M. bangweulensis did not form a clade and differed by 29 bp. The three cephalogonimids (M. nkomatiensis n. sp., M. bangweulensis and C. retusus) differed by 9–29 bp. For 28S rDNA, total pairwise differences ranging from 65–105 bp separated M. nkomatiensis n. sp. from other sequences (Table 6). Intraspecific variability was not assessed through the included sequences. Masenia nkomatiensis n. sp. formed a strongly-supported clade with species of Cephalogonimus (96% ML and 87% P nodal support) (Fig. 3B). The three cephalogonimids (M. nkomatiensis n. sp., C. retusus and C. americanus) each differed from one another by 42–73 bp. Thus, the molecular results strongly support the following relationships: (i) distinctness of the Cephalogonimidae in the Plagiorchioidea (Fig. 3A, B); (ii) molecular evidence of inclusion of M. nkomatiensis n. sp. in the Cephalogonimidae (Fig. 3A, B); and (iii) distinctness of M. nkomatiensis n. sp. and M. bangweulensis (Fig. 3A). 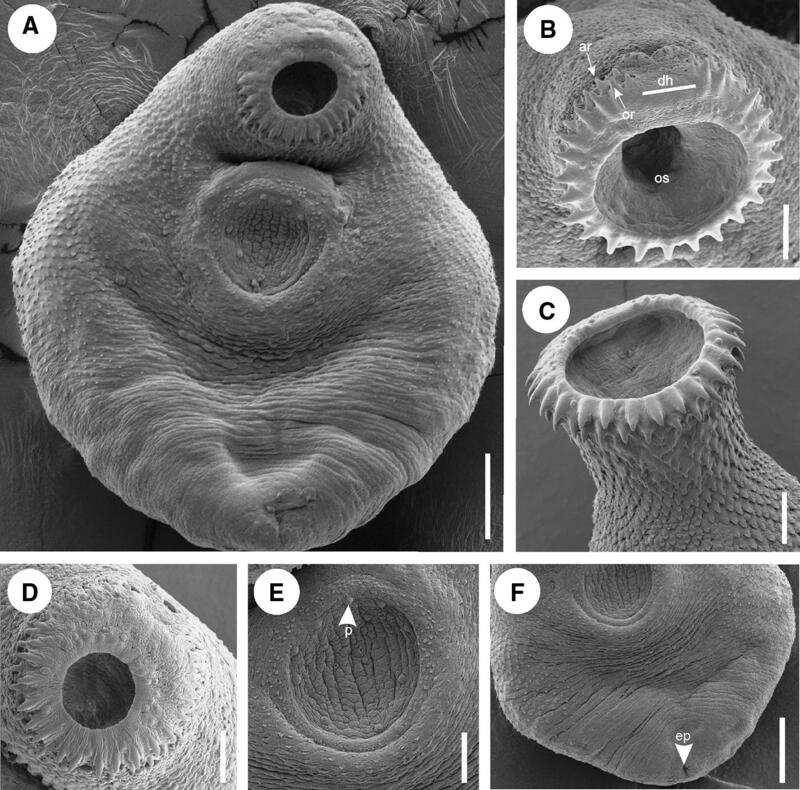 In having a genital pore close to the anterior extremity, two rows of circumoral spines and a Y- or sac-shaped excretory vesicle, the specimens of M. nkomatiensis n. sp. are consistent with the diagnosis of Masenia as presently proposed by Jones & Bray (2008). Other cephalogonimids such as Cephalogonimus spp., Emoleptalea spp. or Paracephalogonimus spp., have a genital pore at or close to the anterior extremity but lack a collar of circumoral spines, and Cephalogonimoides spp. have three to six rows of circumoral spines and a terminal genital pore (Jones & Bray, 2008). Four species of Masenia are currently recognised in Africa and all are clearly distinct from the present species by the small body length and size of the ovary, seminal receptacle and testes. Specifically, M. bangweulensis possesses 44–48 circumoral spines around the oral sucker and a tubular excretory vesicle (Beverley-Burton, 1962), Masenia proteropora (Thomas, 1958) possesses 50–56 spines of the same length and Y-shaped excretory vesicle (Fischthal &Thomas, 1972), Masenia ghanensis (Fischthal & Thomas, 1968) has 56 circumoral spines, and an I- to Y-shaped excretory vesicle (Fischthal & Thomas, 1968), and Masenia synodontis (Khalil & Thurston, 1973) has 36–40 spines and a Y-shaped excretory vesicle (Khalil & Thurston, 1973); all distinct from 50 spines and sac-shaped excretory vesicle in the new species. This is the only record of African Masenia species possessing a sac-shaped excretory vesicle; in other species it is either tubular and I- to Y-shaped. The present species resembles two Asian species, Masenia dayali Gupta, 1953 and Masenia fukienensis (Chung-Ti & Sui-Ming, 1973) by having a sac-shaped excretory vesicle but differs in being smaller in overall size. Furthermore, M. dayali has a conical seminal receptacle, a lobed ovary and small and non-operculated eggs (Gupta, 1953), rather than the reniform seminal receptacle, ovoid ovary, large and operculated eggs present in the new species. Non-operculated eggs and a lobed ovary are also present in Masenia fossilis Gupta, 1953, thus differing from the new species as well. Masenia fukienensis is characterised by large operculated eggs and small oval seminal receptacle (Chung-Ti & Sui-Ming, 1973), instead of the small eggs and large reniform seminal receptacle in the new species. Masenia upeneusi Gupta & Puri, 1982, Masenia carangai Gupta & Tandon, 1984 and Masenia orissai Gupta & Tandon, 1984 are marine species with very long cirrus-sac extending beyond the ventral sucker (Gupta & Puri, 1982; Gupta & Tandon, 1984), while that of the new species extends anteriorly to ventral sucker. Masenia moradabadensis Srivastava, 1951 has a shorter body length and smaller size of the eggs than the new species. Moreover, this species has a tubular excretory vesicle and prostatic cells with a lateral diverticulum, rather than the sac-shaped excretory vesicle, and prostatic cells lacking lateral diverticulum in the new species. Masenia quiloni (Gupta & Tandon, 1984) possesses vitelline fields joining centrally, posterior to the ventral sucker, while in the new species the vitelline follicles form two, non-confluent lateral fields. In Masenia pushpanjalii Singh, Shankar, Singh & Gupta, 2006, M. chauhani Agarwal & Singh, 1989 and Masenia jaunpurensis Maurya & Singh, 2004, the vitelline fields extend from the level of the oesophagus to the region between the anterior and posterior margins of the anterior testis, while in the new species the vitellarium forms shorter fields, between the anterior region of the ventral sucker and mid-level of the ovary. Additionally, the caeca in M. jaunpurensis extend to the level of the anterior testis (Maurya & Singh, 2004), while in the new species the caeca reach the posterior testis. Masenia ritai Sircar & Sinha, 1970 possesses large vitelline follicles, extending between the mid-level of ventral sucker to the posterior margin of the anterior testis and a tubular excretory vesicle (Sircar & Sinha, 1970), rather than the large extension of vitelline fields and a sac-shaped excretory vesicle observed the new species. Masenia vittatusia Agrawal, 1963, Masenia collata Chatterji, 1933, Masenia gomtia Agrawal, 1963 and Masenia agarwali Hasnain & Sahay, 1994 have an oral sucker smaller than ventral sucker and partly spinose tegument, distinct from the new species which possesses an oral sucker larger than ventral sucker and a tegument completely armed with spines, which decrease in number and size posteriorly. Species of Masenia have a striking specificity for their definitive host, which are generally fishes of the Siluroidei. The African Masenia species have been described from three clariid hosts (Clarias melandi Boulenger, C. senegalensis Valenciennes and Heterobranchus longifilis Valenciennes) and one mochokid host (Synodontis victoriae Boulenger). Only M. bangweulensis has been recorded in C. gariepinus by El-Naggar et al. (1992), Zhokhov et al. (2017), Mwita & Nkwengulila (2004, 2008, 2010). The new species was found exclusively parasitising C. gariepinus. A limited genetic dataset exists for Masenia, as well as for the family Cephalogonimidae. Total pairwise differences ranging from 9–73 bp for the two markers confirmed the distinctness of M. nkomatiensis n. sp. from exiting genetic data for cephalogonimids. According to the 18S topology, the new species formed a clade with C. retusus rather than with M. bangweulensis. However, based on this result, it can be suggested that the sequence for C. retusus was based on misidentified material and is actually representing a species of Masenia, or the genus concept for Masenia is poor. Pairwise divergence between the two Masenia species was 29 bp. In the 28S analysis, the new species also formed a clade with Cephalogonimus spp. with strong nodal support. Jones & Bray (2008) transferred the genus Masenia from Maseniidae Yamaguti, 1954 to Cephalogonimidae (syn. Maseniidae), based on morphological features. In the present study, the close genetic relationship of Masenia and Cephalogonimus (type-genus) serves as additional evidence for supporting the inclusion of Masenia in the Cephalogonimidae. Although Masenia spp. are genetically close to C. americanus and C. retusus, they differ in having a collar of circumoral spines around the oral sucker, while species of Cephalogonimus lack circumoral spines (Jones & Bray, 2008). Furthermore, considering the biogeography, species of Masenia are restricted to continental Africa and Asia, while Cephalogonimus spp. are distributed through South and North America and Europe (Tkach et al., 2003). The authors acknowledge Drs Lourelle Neethling and Beric Gilbert, both of the University of Johannesburg for their support in the laboratory and an anonymous reviewer for very valuable comments on a previous draft of the manuscript. The study was approved by the Ethics Committee of the Faculty of Science, University of Johannesburg, nr 2016-11-28/Dumbo and all procedures for collection, transportation and examination of fish comply with the ethical standard guidelines for manipulation and use of laboratory animals in South Africa. The collection permit for this study was issued by the Ministry of Sea, Inland Waters and Fisheries of Mozambique, number 1148/590/GM-MIMAIP/SIC/2016 of 16 June 2016.